NEW YORK and PHILADELPHIA- Wizard World Inc. (WIZD) is proud to announce that popular WWE professional wrestler, television and movie star Bill Goldberg has joined a standout list of celebrity guests scheduled to attend the 11th annual Wizard World Philadelphia Comic Con at the Pennsylvania Convention Center. Goldberg, who will be making his first Wizard World event appearance, will meet fans on Saturday, June 18th. The event, which will feature more than 300 celebrities, comic book creators and great guests, will be held June 17-19. Goldberg followed in the paths of many wrestlers who have made the transition from the gridiron to the squared circle to become wrestling stars – he just did so faster and to a greater magnitude than anyone else in history. 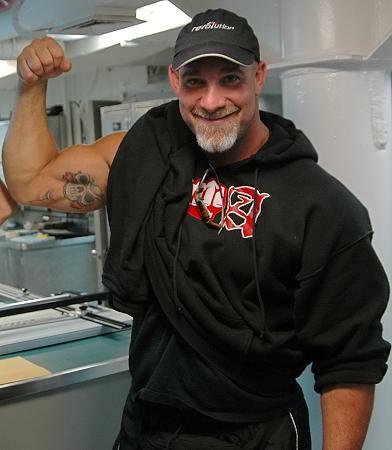 In only his second year in the business, Goldberg became one of the biggest names the wrestling business has ever seen. And now, Goldberg has transitioned from being a star in the WWE to a television and feature film star. In addition to Goldberg, other headline guests on the Philadelphia Comic Con guest list include Bruce Campbell, Adam Baldwin, Pam Grier, Vivica A. Fox, Julie Benz and Billy Dee Williams. The event will bring together thousands of fans of all ages and dozens of celebrities and industry professionals to celebrate the best in pop culture, movies, comics, toys, video gaming, television, gaming, original art, collectibles, contests and more. Goldberg was not a typical wrestling fan growing up, but instead focused most of his attention on football. An excellent player in high school, Goldberg starred as an All-SEC and All-American Nose Guard at the University of Georgia. When his career as a Bulldog was over, he eyed stardom in the National Football League. After spending time with the Los Angeles Rams and then winning the World Bowl with the Sacramento Surge of the World League of American Football, Goldberg signed on with the Atlanta Falcons in 1991. After three years with the team he suffered a torn abdominal muscle which put him out for the 1994 season. Goldberg was signed by the Carolina Panthers in 1995, but could not rebound from the injury sufficiently enough to play. He was thus forced to retire from football. Goldberg never planned on becoming a professional wrestler. He crossed paths with many World Championship Wrestling stars while living in Atlanta. Though the world of wrestling was intriguing to him, joining the ranks of professional wrestlers was not an option that Goldberg seriously considered at the time. Later, Goldberg was working out in a gym owned by Lex Luger and Sting and was convinced by Sting to take a chance in the squared circle. After months of training in the WCW Power Plant, Goldberg made his official professional debut in WCW against Hugh Morrus, pinning the 300 pound wrestler. The next year and a half would be among the most remarkable periods in professional wrestling history. Other wrestling guests scheduled to attend Philadelphia Comic Con include “The Million Dollar Man” Ted DiBiase, Virgil, Candice Michelle, Torrie Wilson, and Brimstone. Children and adult attendees are encouraged to come dressed as their favorite villain, superhero or pop culture personality for the chance to win special prizes in costume contests. Event-goers may also try their hand at interactive product exhibits and shop for collectible comics, movie and television memorabilia, toys and games at more than 200 dealer booths. Philadelphia Comic Con is the sixth stop on Wizard World’s 2011 North American tour. Hours are Friday, June 17, noon – 8 p.m., Saturday, June 18, 10 a.m. – 7 p.m., and Sunday, June 19, 10 a.m. – 5 p.m. Tickets are available in advance online at http://www.wizardworld.com/philadelphia.html at a savings over tickets purchased at the door. Advance adult single-day tickets are priced at $25 ($35 on site); three-day weekend tickets are $45 ($55 on site), and tickets are free for children age 10 and under when accompanied by a paid adult (limit two children per adult). VIP packages with special entry and exclusive items are also available on a limited basis. Wizard World, Inc. produces Comic Cons and pop culture conventions across North America that celebrate graphic novels, comic books, movies, TV shows, gaming, technology, toys and social networking. The events often feature celebrities from movies and TV, artists and writers, and events such as premiers, gaming tournaments, panels, and costume contests. Wizard World, Inc. also produces Wizard World Digital, an online publication covering new and upcoming products and talents in the pop culture world, is distributed on a weekly basis to online and iPad users worldwide.